Qumran is located on the northwestern shore of the Dead Sea, several kilometers south of Jericho. In 1947, in a cave just south of Qumran, Bedouins found the first Dead Sea scrolls. Following this discovery, Qumran was excavated by the Dominican Father R. de Vaux in the years 1951-56. A complex of buildings, extending over an area of 100 x 80 m. was uncovered, dating to the Second Temple period. 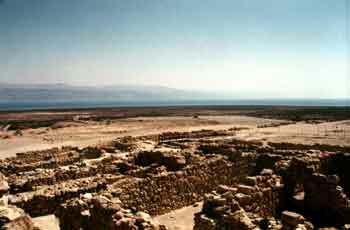 The view of Qumran as an Essene center is opposed by those who propose that the site was a villa, an inn or a fortress. These views are not supported by archeological evidence, and most scholars accept de Vaux's interpretation. Recently, an ostracon (a potsherd with writing) with several lines of Hebrew script, was found at Qumran. It is a contract in which a man named Honi bestows his possessions, including a building, an olive and a fig orchard, to a group called yahad (Hebrew, together). If this reading is correct, it provides evidence for identifying the sect that inhabited Qumran, and the name by which members of the group designated themselves. The term occurs in other manuscripts of the Essenes. 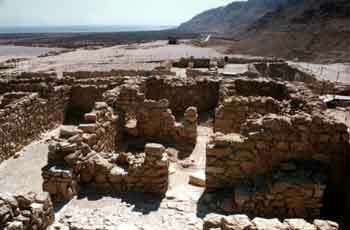 Settlement at Qumran was renewed at the end of the 2nd century BCE, probably during the reign of the Hasmonean King John Hyrcanus I, when the existing structure was restored and enlarged. Then, at the beginning of the 1st century BCE, during the reign of Alexander Jannaeus, renewed building determined the plan of the site until its destruction. An aqueduct was built from a cliff above Wadi Qumran several hundred meters east of the site. Winter floodwaters were collected behind a dam at the foot of the cliff and from there flowed in the aqueduct to Qumran and filled the numerous cisterns and mikva'ot (ritual baths) there. The supply of water was essential to a permanent settlement at Qumran, where summer temperatures in this desert region are extremely high. The plan of Qumran is unique, not at all similar to other contemporary settlements, with its many large halls, undoubtedly serving public functions, and the relatively small number of living quarters. The main entrance to the settlement was in the north, at the foot of a watchtower. The walls of the buildings were made of stones gathered at the foot of the cliff and plastered with thick, white-gray plaster. The windows and doorposts were built of well-trimmed stones and the roofs, as was common in that period, were constructed of wooden beams, straw and plaster. The main structure at Qumran had several rooms, some obviously two stories high, arranged around a central courtyard. In the northwestern corner was a square watchtower with particularly thick walls that rose above the rest of the settlement. The tower served as a lookout and warning post and protected the settlement against raids by desert tribes. A room with benches built along its walls served as a meeting-place for the members of the community and probably as a place for Torah (Bible) study. Additional building complexes, south and east of the main building contained long halls, rooms and ritual baths. One of the large halls was for meetings and served as a refectory. In a storage room and a kitchen next to it, neat piles of hundreds of pottery vessels and a large number of small food bowls were found. A workshop, in which pottery vessels for use of the community were produced, was discovered in the southeastern part of the site. The workshop included a basin for preparing the clay, a potters wheel made of stone and two round kilns for firing. A large number of mikva'ot (ritual baths) was found throughout the site. Excavated into the marl soil, they were waterproofed with thick, gray hydraulic plaster. The broad staircase leading to the bottom was at times divided down the middle by a low (20 cm.-high) wall, which separated those descending for immersion from those leaving after purification. The ritual baths were fed by water from the aqueduct. Mikva'ot similar to those at Qumran were typical of public and private buildings in Jerusalem and elsewhere in the Second Temple period. The Mishnah (Masekhet Mikva'ot) notes the importance of immersion in water for spiritual purification and lists the requirements for such ritual baths. The mikva'ot at Qumran were built according to all these requirements. Unusual at Qumran is the large number of these installations and the size of some of them, relative to the settlement. The latter probably served the members of the community for communal immersion, a central part in their daily rituals. The settlement at Qumran was subsequently abandoned, until the beginning of the 1st century CE, when members of the community returned and settled there once more. They restored the earlier structures and, with various additions and modifications, used them. In the main building was a long room, in which remains of benches, or low tables, made of mud and plastered on the outside, as well as small clay inkwells were found. According to the excavator, these finds indicate that the room was a scriptorium, where the settlement's scribes copied the holy writings and the laws governing the community. Perhaps only a few dozen of the leaders of the community lived permanently at Qumran. Most of the members of the sect, probably totaling several thousand, lived in villages and cities. A large Essene community certainly lived in Jerusalem (according to Josephus, the name of the gate in the southern wall of Jerusalem, at Mt. Zion, was called the Essenes' Gate). For certain periods of time, members of the sect lived in the desert near Qumran and during holidays and community events, many more arrived and lived in tents, huts and the caves nearby. In a survey and excavations conducted recently in the caves on the marl slopes north of the site, pottery vessels were found, indicating the use of the caves as dwellings. Stone circles nearby also indicate a tent encampment. The buildings at Qumran were blocked in the east by a wall of large stones. Beyond it, the marl terraces extend several hundred meters before ending in a cliff. On this marl surface was a large cemetery with over 1,000 graves in north-south oriented rows. A few were excavated, revealing the simplest of individual graves dug into the marl and covered with a pile of stones. Most of those buried weremales, though at the edge of the cemetery there were also graves of females and children. The settlement at Qumran was destroyed during the Jewish War against Rome in 68 CE, and it was never resettled. Scrolls and other objects from the Second Temple period were found in several caves near Qumran, both in natural caves in the hard limestone cliffs west of the site and in caves cut into the marl cliffs near Qumran. When the Roman army approached, the inhabitants of Qumran fled to the caves and hid their documents in them. The dry climate of the Dead Sea region presethese manuscripts, written on parchment, for 2000 years. In Cave No. 4, in the marl cliff south of the site, the excavators found only 15,000 small fragments of an estimated 600 different manuscripts. Individuals in ancient times or modern Bedouin may have removed scrolls from this cave, leaving only scraps. This cave was used by the Essenes as a geniza, a place for keeping worn-out sacred writings. In the 1950s and 1960s, many caves in the canyons of the Judean Desert along the Dead Sea were surveyed and excavated. The documents found there, and in the caves around Qumran, include copies of all of the books of the Bible (except for the Scroll of Esther). The most famous of these is the complete scroll of Isaiah, which was written sometime between the 2nd century BCE and the destruction of the site in 68 CE. This date was recently confirmed by a radiocarbon examination of a sample of the parchment of the scroll. The books of the Qumran library are regarded as the oldest existing copies of the books of the Bible. Writings of the Essene sect, whose spiritual center was located here in the 200 years preceding the destruction of Jerusalem and of the Temple, were also found in the caves near Qumran.